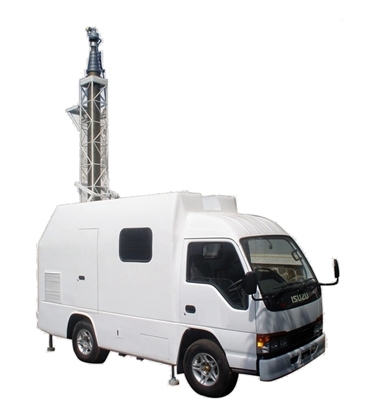 Pneumatic Telescopic Hilomast Tower is using for this Mobile Repeater, which is able to stand alone at the body’s construction vehicle. The functioning of body’s construction and vehicle chassis are as a counter weight foundation from tower’s structure. The tower is being mounted to the body’s construction by using a joint that can cast down the tower during transportation. Hydraulic system is using to lift up and cast down the tower and also horizontal leveling the vehicle which is driven by the vehicle’s machine so that the installation at site can be done without using the electricity power.